Take a break from the stresses of every day life. Come play in the snow! Build some snow friends. and dress them up however you like, in cute fake 3D. So you might be able to tell that Snowfriends isn't really a complete game. In fact, it's barely a game at all. It also doesn't really have too much to do with the theme "Sacrifice" - so you might say I decided to sacrifice some ratings in order to make something fun ayyyyy. Eh? Eh. I tried. But yeah, I didn't have any ideas for the theme, and I really just wanted to not stress out about gm48 yet again, spending upwards of 40 productive hours in a weekend. So instead I decided to just make something nice and experimental, because why not. Gamejams are about making games and having fun. If the game starts up and it's like "whoa, bigger than my display resolution!! ", simply click LMB to start the game → Alt + Enter to enter fullscreen → Escape to pause the game → click "Decrease window size" a couple times → the window should now be smaller if you exit fullscreen mode. @Bakufreak - show me your best snowfriends! Very nice demo on the mechanics and 3D perspective. Wish there was more to do and some story. Maybe sacrifice the snowmen to the yeti people of the North to survive the upcoming blizzard (Just a thought). Awesome! Neat game, though it obviously has nothing to do with the theme. It's nice just walking around and sticking stuff on your snowman. I was a bit disappointed that you can't stack snowballs, though. The graphics look nice and the pseudo 3D effect is very impressive. However, it feels like it's missing some sound effects for walking in the snow and some calm music. I also had a bug where the game screen would turn fully black at certain camera angles. While the 3d effect is commendable, there unfortunately is not much to do in game. No sound was unfortunate. The camera perspective also seemed far too close and limiting. Also the theme, like you said was completely ignored. Also, every game in the jam can be considered a prototype, so not sure that was needed to be stated. Still though, original concept and it is nice to see 3d games made in GM. I really liked rolling up snowballs and making snowmen. At first I thought it was a Katamari style game. It is really impressive to make a 3D game in GameMaker. The game could have used some objectives like making the snowman a certain size. This was very quality. Quite out there too compared to the rest of the games. Good job! For some reason my snowman reminded me of the clown in Twisted Metal... I really don't know why ._. A cool game! Although like you said, not much to do with sacrifice haha. Either way, I thought that the 3D effect was absolutely awesome! Would be interested to know how you accomplished that? (Unless it's a trade secret haha) The game ran smoothly for me, and controls felt nice and natural. Only trouble I had was picking up specific items in a cluster of items. Thank you! Scroll down and find the reply I gave Yumeito for some links on how it works. I love relaxing games with no real purpose except making snowfriends. Good job on making this fake 3D game + it runs smoothly. Also, I saw you eggplant!!! Really enjoyed this one! I lost track of time playing around making eggplant snow friends. Kudos to you for accepting the lack of link to the theme because I for sure would have shoehorned in something about a satanic ritual to summon a yeti. But yeah, ratings-wise can't really give any points for theme or audio. Oh god I love this idea. I'm imagining a sandbox game where you stack the snowballs into snowfriends that move and have attributes based on the items you give them. Then layer features, goals, etc. and that's a game I would really like to play. No connection to the theme and no sound so the ratings aren't going to be overall extremely high, but I'm glad you made this game because it's the seed of a really fun experience. Thank you! 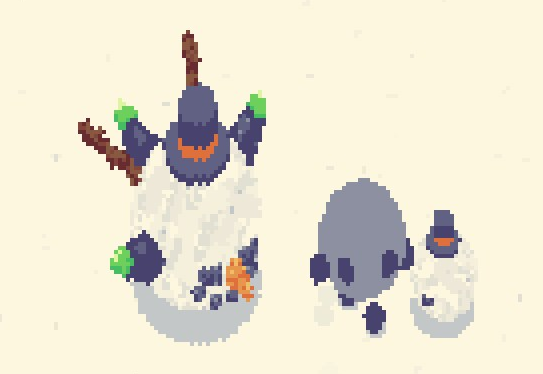 ❤ I may or may not try to work on this a bit more - at least implement snowball stacking, a more involved way to get items, and a way to remove items from snowfriends if you wanna redo them - before lowrezjam in August! This game looks amazing, I love fake 3D and you executed in in an awesome way, but there's no sound and connection to the theme, and the overall score is gonne be lower for that. This is one of the rare cases where the execution is amazing but the base idea just has nothing to do with the jam at all. Also here's my snowfriend and his little blind friend. Well it looked really nice, and seems that you have some experience already from fake-3D. This was more like a sandbox game. Really good graphics. Camera is incredibly annoying and i didnt like it at all. NO CONNECTION to sacrifice which ya know did kill me inside a bit. You could have at least made a fire and you have to throw snowballs in to gain parts to build the snowman but all in all great proof of concept. I spent a lot of time thinking about the best way to approach camera control. Direct mouse control like a third person game was the best I could come up with, sad to hear it didn't work too well for you. Really nice Graphics Method used here. Yeah, stacking the snowballs to make a snowman would be ace... there's no apparent connection to Sacrifice though. I really really like this! Looks super adorable and plays nicely! One of the best looking games this jam! The camera movements make me abit sick but that's about it. At the beginning I was struggling abit because I thought you could stack the snowballs to make a traditional 3-high snowman. After I gave up on that tho and realized the player character was only 1 snowball high, I had a lot of fun. I'm really looking forward for this full release! Thanks for the feedback, glad you liked it ❤ I wanted to implement snowball stacking, but decided to focus my time on putting items on snowballs instead, and that ended up talking all of my time. Take a break from the stresses of every day life. Come play in the snow! Build some snow friends in cute, fake 3D.